The Sinn EZM 3 on strap is the last of the original Sinn EZM series of watches, designed for extreme conditions (the Sinn EZM 1, EZM 2 and EZM 4 models have all been retired). The inert gas filled watch cavity and dehumidifier capsule prevent fogging by guarding against moisture intrusion, and special micro-lubricating techniques allows for operation down to -45 degrees Centigrade. The case has an iron core to protect against extreme magnetic fields. Sand-blasted stainless steel case with rotating elapsed time bezel. Reversed screw down crown and matte black dial with luminous hands and markings. This is the perfect mechanical watch for extreme conditions, whether they be water depth (water resistant to 50 atm), temperature or magnetic fields. This watch is fitted with a black Sinn calf leather strap with white contrast stitching. "Best dmn watch I own..."
Verified Owner Comments: My Sinn EZM 3 is the best-built, and most rugged, tough, durable, precise and accurate watch I own, HANDS DOWN. Mine is 14 years old and still does not have a mark on the case, anywhere. Also my most accurate watch, running typically at +0.75 sec/day. Excellent legibility, a hallmark for clean, legible, functional design. Best dmn watch I own. "Great watch for a lefty"
Verified Owner Comments: Although designed with the crown on the 9 o'clock side of the watch to keep the crown from interfering with a righty's hand movement, I find that the crown is well placed, such that it does not interfere with this lefty's hand movement either. A plus is that I do not have to take the watch off my right wrist to hack the time (which I don't have to do very often with this watch, since it keeps great time), unlike with most other watches with the crown on the 3 o'clock side. 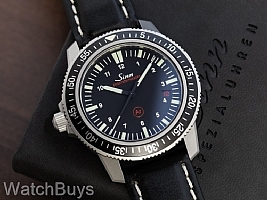 Another quality watch from Sinn. Verified Owner Comments: Just got this as a workwatch, figured it would be good skiing, boating, etc. This is a very serious watch, double the features of a Omega or Rolex and 1/3 the price. The leather strap has a casual sporty feel. Also my wrist is under 7 inches so this 40 mm feels just big enough. I see this becoming my favorite watch in no time. Verified Owner Comments: I have wanted an EZM 3 for quite some time, and I finally decided to pull the trigger two weeks ago. I could not be happier; the quality of the watch is incredible - extremely well made, amazing attention to detail, and it's +/- 0s over two weeks. The WatchBuys customer service is equally as good - you will not be disappointed. I do not see this coming off my wrist any time soon. Verified Owner Comments: Some say the outside anti-glare coating may scratch, but if so that is a minor concern in my opinion as it is coated both sides to the best of my knowledge. Mesmerizing to watch this one tick. Verified Owner Comments: by far the best I own. Verified Owner Comments: Have now had this watch for about 8 weeks and it keeps getting more accurate. Very happy with this purchase and keep getting compliments on it....well done. "Why did I wait so long?" Verified Owner Comments: Rolex quality at 1/5 the price. Prettier than my Rolex sub. I should have bought one years ago. I'll keep my Rolex, but why did I spend so much money on it? Verified Owner Comments: Absolutley love my new EZM 3. As an engineer, I really appreciate all of the Sinn Technology inside of this watch and really look forward to enjoying it for years to come. Watch came on time and appreciated the contact from WatchBuys to make sure everything with my order was ok. Verified Owner Comments: Great service. The EZM3 has the same quality as any of my Rolex at 1/5 the price. Verified Owner Comments: Perfect "use any time, go anywhere" watch. Purposeful built, yet dress watch size and handsome looks. The reason the date wheel was done in red is to separate those numbers from the white numbers going around the dial. Would have looked pretty cluttered there around 4 o'clock. Actually makes sense, and the date is still there for you. Verified Owner Comments: A watch made for the German Border Forces was a fitting choice for my own profession here in America. My proclivity for this watch over other divers was its reasonable size of 40 mm. The EZM 3 is appropriate for any setting from formal business meetings to guarding the border. As others have stated, the only feature for which this watch can be criticized is its date wheel. The selected color is difficult to read when ambient light is moderate to low luminosity. Sinn designed this watch for nonessential information to disappear during operations. Unfortunately, this feature works all too well. Nevertheless, the EZM 3 is still a great choice and a worthy addition to any collection. "All you need in a watch"
Verified Owner Comments: Super nice "tool" watch.. I have owned many Sinn watches. This is one of my favs..
Great all around, good looks, easy to read dial. Not overstated a pleasure to wear everyday. This one is a keeper.. Verified Owner Comments: Absolutely love this watch. I evidently just bought their last one and added the bracelet. Has the typical Sinn quality with a different look than the U series. Classy and dressy enough to be worn anywhere, but robust enough to be a working diver. I told Matt this has instantly become my favorite watch. I've had more compliments and comments in a couple days than with any other watch I've owned. It wears "big" so looks a little larger on the wrist than its 40mm size would suggest. Only funky detail is the red date is too hard to read for my tired eyes, but I don't care much about date anyway on my watch. "A Very Cool Retro-look Diver!" Verified Owner Comments: A perfect size diver for those who don't care for the current trend of oversized wrist watches. As tough, as a watch can be, and I can wear it in any situation.The sandblasted case adds to its sporty, yet serious, appeal The small amount of red script, makes the dial pop. A whole lot of "funky/cool" tool watch goodness here. "No need to pay more"
Verified Owner Comments: Awesome, last of the great EZM tool watches. Get one while you can. Love mine. "My tried and trusted EZM3"
Verified Owner Comments: So how many fine sport watches can you find with a lefty crown? Not too many. Maybe an Oris TT, but it doesn't hold a candle to the Sinn EZM3. Has been one of the most durable, time reliable and comfortable sport watches I've owned. Tough to find but German engineering to a "T." Pretty cool to trump so many more common place and WatchBuys has been a delight with service. Okay...only bad is that the date dial is in red and a little tough to read at a glance. Other than that the watch has been perfect! Get one before they're history like rest of EZMs! Verified Owner Comments: At a time when so many dive watches are behemoths, this one is perfectly sized for business or casual dress. The dial is a classic. And despite what some say, the bezel action is not too loose and pleasing to me. Verified Owner Comments: I have owned this watch for a few years now, I love it, a beautiful watch. "Next best thing to an EZM1"
Verified Owner Comments: If you liked the EZM1 then you need to get the EZM3.